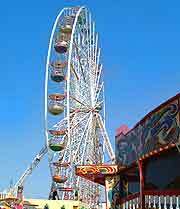 The weather in the town of Blackpool is typical of English seaside weather, although in recent years, the summer months have been exceptionally sunny and the winters fairly mild. December, January and February tend to be Blackpool's coldest months, with an average daytime temperature of around 3°C / 37°F. 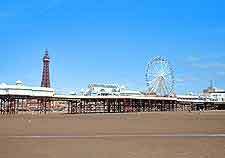 Blackpool is said to have a moderate climate, which is typically northern. The wettest months in Blackpool fall slightly earlier, between September and November, when you can expect approximately 110 mm / 4.3 inches of precipitation every month. The overall rainfall is at its least in March, April and May, with just 56 mm / 2.2 inches expected each month, making these the resort's driest months. Summer is always the most popular time to visit Blackpool and temperatures soar at this time of the year, with highs regularly topping 20°C / 68°F between July and August, and often rising higher during the sunniest weather. Towards the end of August, it becomes clear that autumn is approaching and the temperatures slowly begin to drop, averaging 16°C / 61°F in September, although many fine days can still be expected. September tends to be a much quieter month than August and is an excellent time to visit, while the climate is still favourable. Spring is also particularly appealing and towards the end of April, you can be sure of plenty of sunny weather with temperatures of 13°C / 55°F or more, rising considerably higher during May. However, the nights can still feel rather chilly and occasional frosts in late spring are by no means unheard of.